Built for a total of $24.5 million, the building is devoted exclusively to the health and natural sciences. Classrooms, laboratories and faculty offices for the departments of biology, chemistry and nursing occupy the three floors of the 61,000-square-foot facility. The building is designed to put science on display. Ample windows—both to the outdoors and into classrooms and laboratories—enable students and professors to see teaching, learning, exploration and discovery in practice. The science center increases the number, size and flexibility of labs and provides space where long-running experiments can be staged, facilitating more faculty-student research that prepares students for graduate school admittance and success. With the addition of the DeWitt Family Science Center, Northwestern is able to move its nursing department from an off-campus location into the heart of campus and collaborative proximity with the biology and chemistry departments. The nursing floor includes hospital bed stations equipped with human patient simulators, observation rooms for faculty to watch students practice nursing techniques, and the ability to record and review video of students working with different medical scenarios. The building also includes a 960-square-foot greenhouse and a vivarium. An equipment budget will fund the purchase of a DNA sequencer, making Northwestern one of only two institutions in Iowa with the scientific instrument. The DeWitt Family Science Center was named in honor of Jack and Mary DeWitt of Holland, Mich., who contributed the $6 million lead gift for the building—the largest single gift in Northwestern’s history. The science center was part of a $30 million Discover Campaign that included money for the building, science scholarships, and undergraduate research fellowships. Dr. Bryan Den Hartog, a Northwestern graduate, member of the college’s Board of Trustees, and orthopedic surgeon with Twin Cities Orthopedics, served as the campaign’s chair. Jack DeWitt died June 22, 2018, at the age of 75 after a battle with brain cancer. Over the course of his lifetime, he and his wife gave more than $10 million to NWC. In addition to the science center, the college’s DeWitt Learning Commons and DeWitt Dining Center bear their names. Jack also served on the college’s Board of Trustees for 13 years. Mary DeWitt will speak during the dedication program, as will Marty Guthmiller, chair of the Board of Trustees, and Greg Christy, president of Northwestern College. Members of the DeWitt family will participate in the ribbon-cutting. CMBA Architects of Sioux City and HGA, a national architecture and engineering firm, designed the DeWitt Family Science Center. OPUS Design Build was the general contractor. 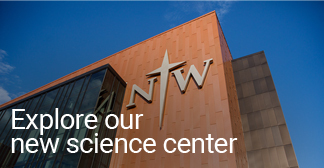 During the inaugural year of the DeWitt Family Science Center, Northwestern will host a speaker series titled Science as Faithful Witness. The series will feature Old Testament scholar Dr. John Walton, “Origins” co-authors Drs. Deborah and Loren Haarsma, and several accomplished Northwestern College science alumni. Parking for the dedication ceremony is available west of the Juffer Athletic Fieldhouse and north of the DeWitt Learning Commons.